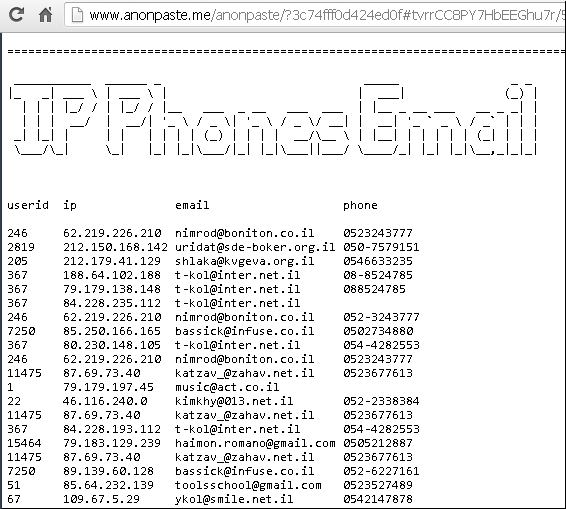 This Morning Anonymous member with twitter handle @OsamaTheGod leaked a huge database from server of Israeli Musical Act Magazine (act.co.il). The leaked database posted on public note website and includes users ID, username, password in clear text, IP address and phone numbers. Hacker posted data of about 10000 users from the site. Reason of hack yet not mentioned anywhere, but because hacker use #OpIsrael hash in his tweets, so this could be an attack against Israel in fight of Anonymous vs Israel. Stay tuned for further update.